I need a total of 20 digital buttons on my setup. I saw this video: where this dude hooked up one side of the button to the analog +, and on the other side he attached 2 wires, one going to the #, and the other connecting to a resistor and then to the -. 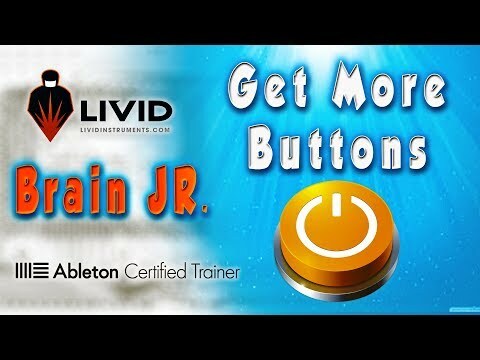 Then I found this discussion in the forums: http://forum.lividinstruments.com/discussion/18917/can-you-connect-momentary-buttons-to-analog-connections-on-brain-jr which references the "button mode" setting in the Brain V2 Configure utility and states that I'd need a 10k resistor. I did a little math and figured that 3W should be the right resistor for the job, and I wired this up in my rig. However, It didn't seem to work once I was trying it out in the Config utility. So, I cut off the resistors and wired the buttons to the + and - on the analog block and set those analog lines to "btn" in the Config, and I turned on the "flip" so I get 127 when I press the button and 0 when I let it up. I've got IDs 3,4,5, and 6 (MID notes 67, 68, 69, and 70 respectively) in the analog block set this way. Is there a way to get the Brain Jr. to handle these as discrete notes for each of the buttons? Thanks for the help - I'm pretty new to all this and it's been fun working on the little mysteries. Ok, i got everything wired up exactly as described and it's still not working right for me. I'm finding that the button signal works about 1 out of every 50 button pushes, and the signal is sent very slowly - it lags the button push (and release) by somewhere between 2-5 seconds. The other 4 pots hooked up to my analog inputs are sending just fine with no lag. I tried setting the buttons to "pot" and "btn" just in case there was an issue there, but it didn't seem to improve the situation. I really don't understand what's going wrong but it seems like I'm close to the solution. Any help is appreciated! I've tried all four of the buttons on various analog inputs with the same behavior. I've tried all four buttons on one of the inputs on the digital block and all four buttons worked. So I know it's not a mechanical problem with the switch in the buttons, nor is it a physical problem in the wiring on the buttons. I'm completely lost on what to do with this. This seems like it should be so easy to do, and from the youtube video is looks like it's as simple as falling off a log, yet I can't make it happen at all. At this point, I'm willing to pack up the controller and mail it to someone who knows how to work this miracle so they can lay hands upon my box and see if they can't make it want to behave. :D As always, any help or direction is much appreciated. Figuring that the problem must be related to the resistors I was using, I did some un-soldering and re-soldering, and replaced what I had with 10K Ohm 1/8W and put everything back together to see if things would work differently. Sadly, there's no change to the behavior I'm getting. Could it possibly be that there's some kind of defect in my Brain Jr. board itself that is preventing this from working? It seems like all of its other functions are AOK. I really appreciate any help that anyone could extend to assist in solving this mystery. OK - I've triple-verified that I've got the button sides wired as described above. Thanks again for all the help. I feel like I must be making some kind of amazingly simple error here, and I just can't figure it out. OK, this is really starting to get Twilight Zoney on me here. I get the same behavior if I'm set to pot mode. After reading this last reply, I plugged everything back in a tried again, and for some absolutely unknown and unexplainable reason, I got consistent, timely response out of note 77, but not the other three. I do not think there's a diode in the buttons - these are standard Sanwa arcade buttons, and opening them up all I see is the switch assembly. I decided to test the buttons on the digital block one more time, and here's where it gets strange again. With nothing plugged in to analog 13, 14, 15, 16, I unplugged digital 1 and plugged in my "mystery" button's red and yellow (no resistor) ends into CC1 on the digital block. The Brain Jr. Tool reflected activity on note 77, 78, 79, or 80 (inconsistently) during the different tests, only upon the first button press, and then reflected only the on and off of CC1. All buttons reflected on/off on CC1 with the wires in both directions. So I don't think there's anything wrong with the buttons or the wires. I did the wire jump test as described on analog 13. 14. 15. 16 (note 77, 78, 79, 80 respectively) and when I have the wire plugged in to the # on 12 (note 77), if I get my hand within about 2" of the other end of the wire, I get massively repeating on and off data on notes 77, 78, 79, and 80. When I finally plug the wire into either the + or the - this massive repeating of note data stops, but so much has flown by that the data I see isn't very helpful. BTW, I was wearing a grounding strap which was attached to the ground on my powered-on DJ mixer, but I found the same behavior when I was ungrounded as well. I'm not sure if this was ever resolved, but I am having the same problems as unclenoah. When I try to use the btn mode with the analog headers I can't get any response. It even fails when I do a direct wire test. I can get response in the tools window in pot mode though. It makes me wonder if the brain jr may be malfunctioning. I have two brain jrs and am using momentary switches with 10k pots on the analog headers on my 2nd brain without any problem so I at least know my wiring is correct. Slightly abused may have been an understatement... Im pretty sure I messed this brain up at some point. I think I'd best just replace it. Hey Tor! I'm glad to know at least I'm not alone with this issue. I've not been able to resolve it, and I've been thinking I'm just going to reconfigure my controller design to include more analog controls and forget about trying to add these additional digital buttons. If you figure any of this out, please let us know!